This interview was originally published in Words without Borders. In recent years, a proliferation of books in translation for children and young adults has brought imaginative stories from around the world to new readers. We’re speaking with some of the extraordinary publishers who make these books possible about their experience working in this vital field. For the second installment in the series, we spoke with Ilan Stavans, publisher of Restless Books and their children’s and young adult imprint, Yonder. Words Without Borders (WWB): How long have you been publishing children’s literature in translation and what inspired your decision to do so? 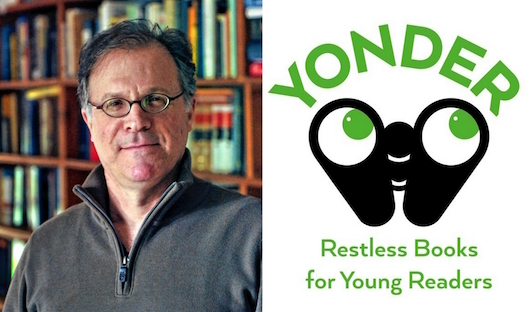 Ilan Stavans (IS): Yonder is the new children’s and YA imprint of Restless Books. After much planning, it is launching this season. Its existence is due to two forces: The first is the desire to continue bringing superb contemporary world literature to English-language readers worldwide. It is inexcusable that Shakespeare’s tongue, compared to other languages, occupies itself so meagerly with translation. In Elizabethan times, the circulation of translation is what made London such an exciting capital. The appallingly low percentage of books in translation published annually in the United States (only 3%) must be augmented—especially in the age of Trump, when nationalism is a synonym for isolationism. The second force is the fruitful relationships Restless Books has established with independent booksellers all over the United States and elsewhere in the English-speaking orbit, who have fed us an enormous amount of excellent suggestions of children’s and YA books that ought to be translated. As you know, translators and booksellers are the best ambassadors of literature. They listen to the pulse of what’s alive and we, in turn, listen to them closely. In large part, Yonder, as well as Restless Books, is a collaborative effort with all of them. WWB: How did you select Juan Villoro’s The Wild Book as Yonder’s launch title? And how have you found the other authors/works you’ve published, or are planning to publish, with Yonder? IS: Villoro’s The Wild Book has been enormously successful in the Spanish-speaking world, becoming an audience favorite, with over one million copies sold. The work of Latin American writers circulates well in the English-speaking world, but only among adult readers. There is a rich tradition of children’s and YA books that young English readers are entirely unfamiliar with. Yonder is eager to introduce them to these great authors. Personally, I love The Wild Book: it is sharp, suspenseful, adventurous, and it has the DNA of Latin America. We already have a lineup of magical Yonder books from Mexico, India, France, Italy, Spain, and more to come. We’ve been flooded with suggestions of literature that has never been translated into English. If adult reading suffers from American exceptionalism, the situation is worse in children’s and YA books. For a long time, the unrecognized bias has been that books from other parts of the globe won’t travel well into English because “little” readers are too sensitive, too vulnerable, and because each culture has a different metabolism. That’s all baloney. It is precisely at a young age, in childhood and adolescence, when the strongest impact can be made in terms of exposing people to other cultures. A new sensibility can emerge. Reading, an act where the imagination runs free, is the way to do it. WWB: What have been some of the most exciting aspects of the undertaking so far? What (if any) have you found to be the most challenging aspect of publishing children’s literature (as opposed to literature for adults)? IS: Yonder represents not only a new venue for Restless Books, but has also necessitated a process of education. Publishing children’s and YA books is an entirely different universe from our areas of expertise. We’ve been busy studying how this universe works. Cover and interior design, marketing and publicity, editing—all these aspects need to be understood on their own terms. Our first Yonder titles are undoubtedly going to give us new, valuable insights. WWB: Are there perspectives/voices/languages/cultures you’ve noticed are conspicuously absent from the children’s literature available to English readers? IS: Arab literature. I just came back from the Sharjah Book Fair, in the United Arab Emirates, where I met with Turkish, Egyptian, Jordanian, Saudi, and Emirati authors, agents, and publishers. Western civilization’s pervasive stereotypes have prevented the English-speaking world from exploring this deep well of literature. These children’s and YA books are a way to combat this prejudice. I also just returned from the Feria del Libro de Santiago, in Chile. Children’s literature is astonishingly vigorous in South America. Chile has an enormous Palestinian population, the largest outside Palestine. I came across a wonderful children’s book about Palestinian-Israeli relations that revolves around soccer. WWB: Have you noticed different trends or subjects in the children’s and YA literature of other countries that contrasts with what we see in the US? Are there countries that have a particular focus on children’s literature in translation? IS: The United States is more obsessed with children than many other places. In some countries, children’s literature tends to be more pedagogical, emphasizing morals. Diversity is a forefront topic in the United States that isn’t everywhere. In general, English-language children’s books travel well. Maurice Sendak, Eric Carle, Curious George, and others are available in translation. This is also a strategy through which American culture makes itself present elsewhere. It isn’t symmetrical the other way around: Japanese, Swahili, Catalan, and many other languages have children’s books that are unknown in the US. Of course, not every book is equally translatable. Have you ever seen Doctor Seuss in Spanish? It’s harder than Othello. WWB: What are you looking for in a children’s story as a publisher and as a reader? What do you think draws a child into a story? Do you think that a good children’s book will always have some appeal for adults as well? IS: I’m looking, first and foremost, for first-rate storytelling. A good story is good in any language. I’m also looking for unique sensibilities. I want Yonder readers to discover other worlds without feeling a teacher is banging them over the head with a lesson. Children’s literature, we must always remember, has two audiences: children and their adult caretakers. Their importance is in that order. If you don’t satisfy the caretaker, you don’t reach the child. But if you only satisfy the caretaker, you’ve missed the child. WWB: Do you think there has been a general upsurge in children’s publishing in recent years? What do you think has brought it about? IS: A few years ago, I curated a museum exhibit on the Jewish picture book, which originated with the medieval Haggadah, a narrative about the departure of the Israelites from Egypt. The Haggadah was an illuminated volume focused on entertaining children during the long meal called the Seder. That’s where the first images for children’s stories in the Jewish literary tradition come from. Children’s books acquired gravitas at the end of the nineteenth century, but it wasn’t until after the Second World War that the industry in the United States built its infrastructure. Other linguistic habitats took longer. In part, this was the result of insightful, revolutionary studies on child psychology, including Freud’s psychoanalytic theories on parent-children relations. The outcome was clear: early experiences are considered essential to a person’s character. Within a few decades, social mores changed dramatically. Children’s and YA literature exploded because we came to understand that these stages of life have their own metabolism. WWB: What is a new or forthcoming title that you are looking forward to sharing with readers? IS: We have a terrific illustrated adaptation of the Ramayana coming up, as well as a memorable YA novel about the Spanish Civil War, and an illustrated book on the importance of individuality from France. WWB: What’s next for Yonder? IS: A hefty, healthy future. Restless Books, and its Yonder imprint, recently transitioned to become a nonprofit. I dream of raising money to expand the number of Yonder titles we can put on young readers’ bookshelves. Restless Books—and its children’s and YA imprint, Yonder—is an independent, nonprofit publisher devoted to championing essential voices from around the world, whose stories speak to us across linguistic and cultural borders. We seek extraordinary international literature that feeds our restlessness: our hunger for new perspectives, passion for other cultures and languages, and eagerness to explore beyond the confines of the familiar. Our books—fiction, narrative nonfiction, journalism, memoirs, travel writing, and young people’s literature—offer readers an expanded understanding of a changing world. Ilan Stavans is the publisher of Restless Books and the Lewis-Sebring Professor of Humanities, Latin American and Latino Culture at Amherst College. His books include On Borrowed Words, Spanglish, Dictionary Days, The Disappearance, and A Critic’s Journey. He has edited The Norton Anthology of Latino Literature, the three-volume set Isaac Bashevis Singer: Collected Stories, and The Poetry of Pablo Neruda, among dozens of other volumes. He is the recipient of numerous awards and honors, including a Guggenheim Fellowship, Chile’s Presidential Medal, the International Latino Book Award, and the Jewish Book Award. Stavans’s work, translated into twenty languages, has been adapted to the stage and screen. He is the cofounder of the Great Books Summer Program at Amherst, Stanford, Chicago, Oxford, and Dublin, and the host of the NPR podcast In Contrast. An entrancing adventure for today’s troubled planet, The Casket of Time is a fantastical tale of time travel and environmental calamity from celebrated Icelandic author Andri Snær Magnason. From one of Italy’s favorite authors of young adult literature comes a gripping, true-to-life thriller of a Sicilian boy’s fight to survive after his family is torn apart by the Mafia. Who Left the Light On? From French author-illustrator duo Richard Marnier and Aude Maurel comes a captivating picture book about creativity, diversity, and self-expression. One of the world’s oldest and best-loved tales, now retold and illustrated in thrilling detail for readers of all ages. From one of Mexico’s foremost authors comes a wondrous adventure story of a boy who goes to live with his kooky, book-obsessed uncle in a library where books have supernatural powers. A one-of-a-kind, uplifting picture book about a Jewish boy and a Palestinian boy who bond on the soccer field—translated into English, Hebrew, and Arabic. From the New Yorker “20 Under 40” author of Atmospheric Disturbances comes a brain-twisting adventure story of a girl named Fred on a quest through a world of fantastical creatures, strange logic, and a powerful prejudice against growing up. In a gorgeously retro illustrated reimagining of “The Little Mermaid,” Israeli author Nurit Zarchi and illustrator Rutu Modan bring us the poignant story of a worrywart named Whatwilltheysay, whose life is turned upside down by the spunky mermaid who shows up in his bathtub one day.